President Barack Obama and other world leaders are attending the G-20 economic summit in Pittsburgh today. The GIS Research and Map Collection (GRMC) on the second floor of Bracken Library houses a large collection of maps and other cartographic resources on the city of Pittsburgh. Street maps of Pittsburgh in the GRMC cover the metropolitan area, the central part of the city, and downtown. Baldwin, Bellevue, Bethel Park, Brentwood, Castle Shannon, Oakwood, and other adjoining communities are also featured on street maps of Pittsburgh. 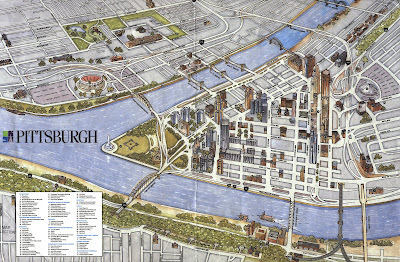 The downtown area is covered on several maps in the GRMC, including Downtown Pittsburgh: An Axonometric View of the Three Rivers City. Oblique aerial photography of the Golden Triangle and the adjacent district is also included in the Collection. Tourist maps of the city of Pittsburgh are available in the ready-reference area of the GRMC. The Gousha recreation and shopping guide map features a directory of activities available in the city. Pittsburgh Map and Visitors’ Guide and Pittsburgh Walking Map and Guide are also excellent maps for tourists visiting the area. The GRMC also includes maps useful for researchers, including a map showing land use and land cover in the greater Pittsburgh region. Navigation charts of the Monongahela River, the Allegheny River, and the Ohio River are also available. Researchers studying the history of the city will find a map of Pittsburgh from 1902 in the GRMC. The map is from the Library of Congress’ American Memory Collection of Panoramic Maps, 1847-1929. View of Pittsburgh and Allegheny from 1874 offers another aerial view of the historic city. The Atlas Collection includes a Pittsburgh streetfinder guide. Urban Atlas: Tract Data for Standard Metropolitan Statistical Areas: Pittsburgh is also available in the Atlas Collection. Maps in the GRMC circulate for two weeks or longer. Atlases circulate for four weeks or longer. For more information about any of these resources, please contact the GRMC at 765/285-1097 or visit Monday through Friday 8:00 A.M. to 5:00 P.M.